What does it take to dress a president? One doesn’t have to seek out the presidential tailor to find out, merely talk to some Imagineers. When The Hall of Presidents is refurbished the wardrobe of the entire congregation of Presidents is examined. Typically the Audio-Animatronics wear through their clothing in the same places we do, and for the same reasons. The elbows, knees, and other joints are inspected closely for wear and tear from the figures’ movements, and new clothing is selected. Of course, these being the Presidents of the United States, no detail is too small. Imagineers scour through paintings and photographs to make sure that the wardrobe selection for each president is as close to the clothing that they would have worn as President, both in terms of style and era. 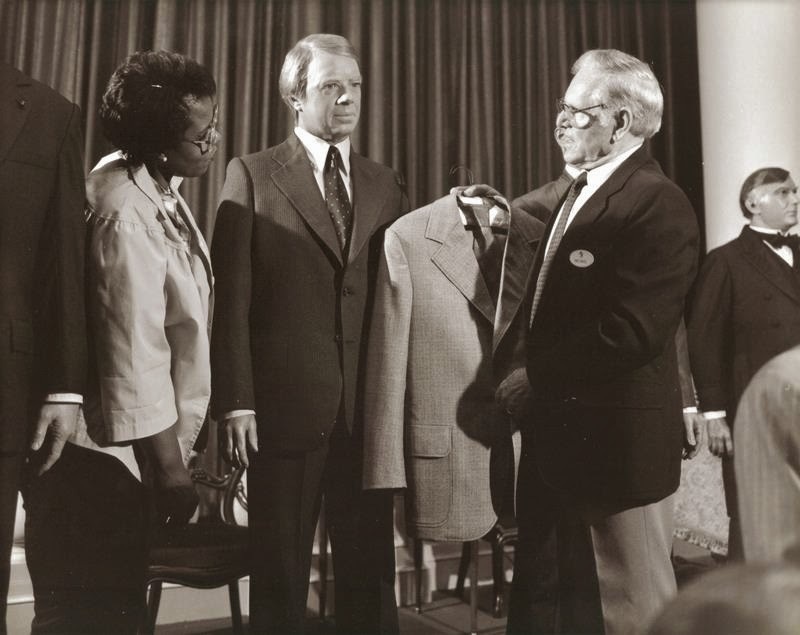 This photo from 1988 shows President Jimmy Carter being sized up for a new outfit. Coincidentally, that same year, Jimmy Carter would receive a bronzed bust of himself from The Hall of Presidents. The bust, sculpted by the renowned artist Blaine Gibson, was presented to President Carter by Mickey Mouse and Walt Disney Company for the Carter Presidential Center in Atlanta, Georgia.